However, the exception is raised in the FME Python Caller in the line above before it gets to my conversion function. This happens with FME 2015, not FME 2011. Is there any workaround? The solution will depend on how FME has recognized the character set of the attribute. This was a good suggestion, but it didn't work for all of the strings in my input file. 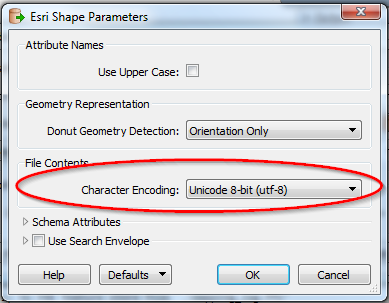 As well, I have DWG inputs which do not allow you to set the character encoding. ...tells Python to convert the string to ASCII, and if there are errors, ignore them.